﻿Published by Sareth Ney on April 13, 2017 at 8:07 p.m.
JACKSONVILLE, Fla. – Set times for the band and the Eat. Rock. Repeat. food vendors have been announced for Monster Energy Welcome To Rockville , for April 29 and April 30. On April 29, Soundgarden is the headliner and The Offspring is the direct support on the Monster Energy Stage. Coheed and Cambria, Eagles of Death Metal, All That Remains, I Prevail and Goodbye June are the opening acts. A Perfect Circle headlines the Metropolitan Stage and Mastodon will be the direct support, on April 29. The Pretty Reckless, Highly Suspect, Starset, Dinosaur Pile-Up and Badflower will be the opening acts. Pierce The Veil headlines the River Stage and In Flames are the direct support, on April 29. Frank Carter & The Rattlesnakes, Volumes, Royal Republic, As Lions and The Charm The Fury are the opening acts. Def Leppard is the headlining act and Papa Roach is the direct support on the Monster Energy Stage, on April 30. 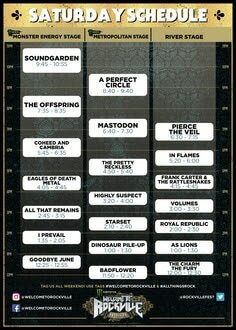 Three Days Grace, Of Mice & Men, The Dillinger Escape Plan, Nothing More and Rival Sons are the opening acts. Chevelle will headline the Metropolitan Stage and Seether is the direct support, on April 30. 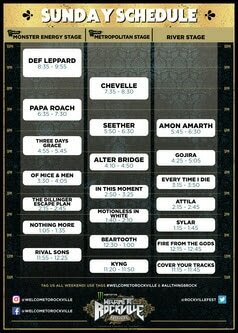 Alter Bridge, In This Moment, Motionless In White, Beartooth and Kyng are the opening acts. Amon Amarth headlines the River Stage and Gojira is the direct support, on April 30. The opening acts are: Every Time I Die, Attila, Sylar, Fire From The Gods and Cover Your Tracks. Danny Wimmer Presents will debut Eat. Rock. Repeat. Those involved are Bacon Invasion, Nice Tots Little Philly and Pie Hard. Other dining experiences include: Mojo’s BBQ, Indochine Thai Peninsula, Taco Lu’s, Sweet Pete’s, Brucci’s Pizza, Island Noodles, Cely’s Filipino Food, What’s The Catch Fish Tacos, Rock N’ Roll Arepas, GuanaBana Ice Pops, Pie Baby, Nomi’s Island Girl Foods, Hebros Bacon Restaurant, Grumpy’s Homemade Ice Cream, Girls Gone Green Nacho Bar, Pele’s Wood Fired Pizza, Angry Bird Grill, Knuckle Sandwiches, Catullo Brothers, Mount Olympus Greek, Funnel Cake Fantasy, Mac’ Attack, Classic Home Cookin’, Pounders Burgers, Mystery Melt Machine, Ollie’s Tots, Ben’s Burrito Bowl, Master of Patties and Mama’s Food Truck. Attractions include: Jack Daniel’s Experience, The Music Experience, FYE Fan Experience, Jacksonville Jaguars Rock ‘N’ Jock and more. Sponsors of Monster Energy Welcome To Rockville are: Monster Energy, Bud Light , Jack Daniel’s, The Music Experience, Zippo, Metro PCS and more. 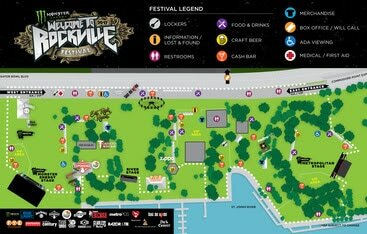 ​Tickets to attend Welcome To Rockville can be purchased here.